PS: Asians have come to her defense too. DID ANYONE ELSE SEE THE STORY ABOUT THE GIRL WHO CHOSE A CHINESE DRESS TO WEAR TO PROM? 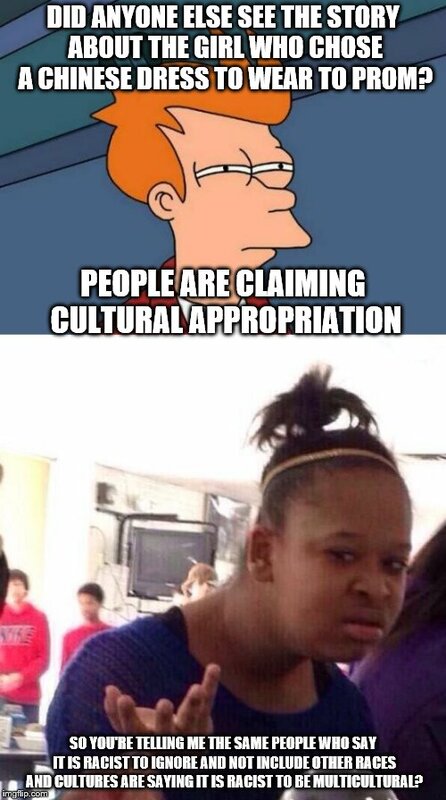 PEOPLE ARE CLAIMING CULTURAL APPROPRIATION; SO YOU'RE TELLING ME THE SAME PEOPLE WHO SAY IT IS RACIST TO IGNORE AND NOT INCLUDE OTHER RACES AND CULTURES ARE SAYING IT IS RACIST TO BE MULTICULTURAL?